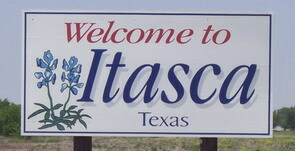 Welcome to Itasca, Texas -- a city on the road to a better and brighter future. Our intent is to provide you with some information about Itasca. You will find a brief history of Itasca, City information, as well as information on Itasca Independent School District, local businesses, and how to contact certain entities, all of which you may find helpful. Itasca is a culturally blended community with a variety of parades, festivals and community events. Itasca is a mobile community. Even though there are some jobs available locally, many Itascans prefer to live here and work elsewhere. Itasca is centrally located to many tourist attractions, lakes, and other recreation areas in this region of Texas. We are half way between Fort Worth and Waco, making access to a variety of shopping areas, sporting events, and recreation areas within an hour, while many others are not much further. Under normal driving conditions the drive to the DFW airport is just over an hour, while other sites such as the Ameriquest Field (formerly the Ballpark in Arlington), Texas Motor Speedway, Lake Whitney, Joe Pool Lake, the Brazos River, the Trinity River, Six Flags, the Fort Worth Zoo, the Dallas Zoo, The Cameron Park Zoo, Texas Heritage Museum, and the Texas Rangers Museum are all less than a one hour drive. Whatever you like to do, it is likely to be found nearby!